Types of Fossils – Part Four! So, the final part! The last lot of fossil types! And today we will be looking at the last type of fossilisation – permineralization. Permineralization is when a creature gets fossilised, but the original parts are still there. So they are preserved in minerals, either by the minerals impregnating or encasing them, the animal parts are still there! Let’s look at an exciting example – dinosaur bones! Specifically, we will be looking at a dinosaur bone from Queensland in Australia. It is a tail bone from a large sauropod dinosaur, the ones with the long necks. 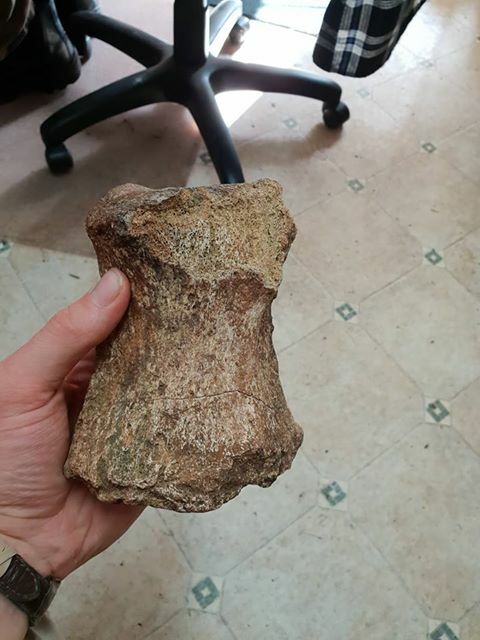 Dinosaur tail-bone from Queensland, Australia. So what’s happened here? Well, the dinosaur had been swept up and buried really quickly. As it gets buried in sediments, the minerals from those sediments seep into the bone. In this case the minerals are mostly iron and calcium carbonate-based minerals (such as quartz). Bones are very porous, full of holes and spaces. So the minerals fill these holes, making the bone heavy and turning into a preserved fossil – but the actual bone that was in the dinosaur is still there! Here you can see the minerals that have in-filled the pores and spaces within this dinosaur bone. The minerals are mostly iron-based. This makes it really exciting when you dig up permineralized bones. It means you are digging up the actual bones that were in the animal. Wow! So, can you replicate this? Yes you can! In fact, here’s a simple way for you to do it. A dish-washing sponge (or a car washing sponge if you want to go big – will just take longer!). Boiling water – make sure you get an adult to help! Salt. Epsom Salts works best – you can purchase them from garden centres or online, however table salt will work, and Himalayan rock salt works the best out of the table salts. The process is simple. Use scissors (again, maybe get an adult to help!) to cut out a basic bone shape with the sponge. This is your ‘dinosaur bone’. Pour boiling water in the bowl and stir in as much salt as you can until no more will dissolve in it. This is called a saturated solution and is your ‘sediment’ that will fossilise your ‘bone’. Wait until the water is cooler, then put your sponge-bone into the solution. Make sure it soaks up as much as it can. Then simply place the bowl in a warm, dry place, and wait for a few days until the water evaporates. You will be left with a sponge that is much heavier, and encased and filled with minerals – basically permineralized! So that’s it! Types of fossils over! But before we completely finish, there may be a sneaky bonus next week……..
God bless, and follow me on www.indianajoe.blog and see the work I do with Creation Research at www.creationresearchuk.com!